and is ideally positioned to assist you with the sale of your property. Unlike many franchise operations, our real estate office is locally owned and operated. This means we function in complete autonomy, and are not locked into any selling system. To ensure that you can make an informed decision, the team at First National Dee Why analyse local sales trends and price movements on properties similar to your own. We can offer you an appraisal that you can rely on. 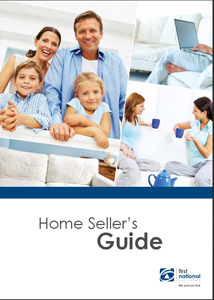 Click on the image to download your copy of the First National ‘Home Sellers Guide’. Alternatively click here to contact our professional sales team who can assist you with your real estate enquiry or provide you with a free market appraisal of your property.